I love Red Rocks. The density of high quality climbs of every style and skill is amazing. 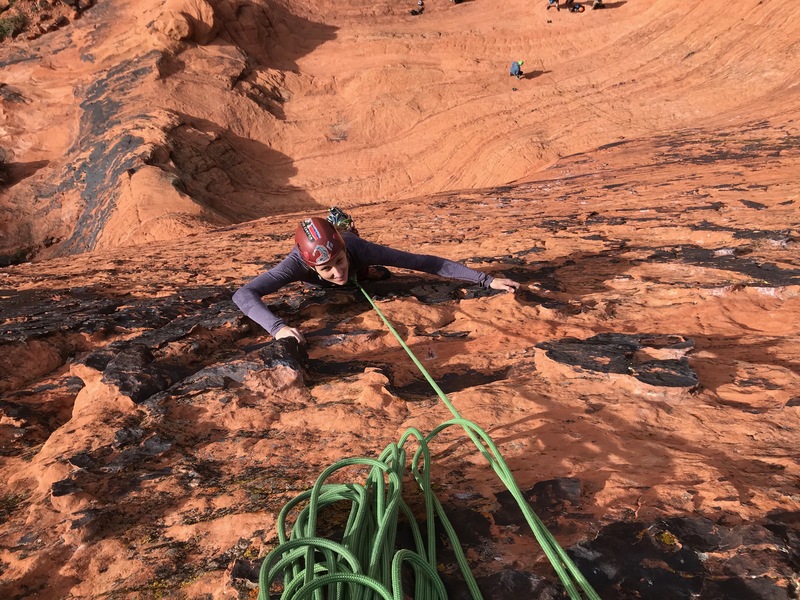 The multi-pitch trad routes to the top of red streaked mountains are long and fun. The rock is really good due to a strong black varnished crust over the tan sandstone. After nine hours driving there we were greeted with the typical, “I cannot find a place to sleep at Red Rock Campground” tour of a full camping area. 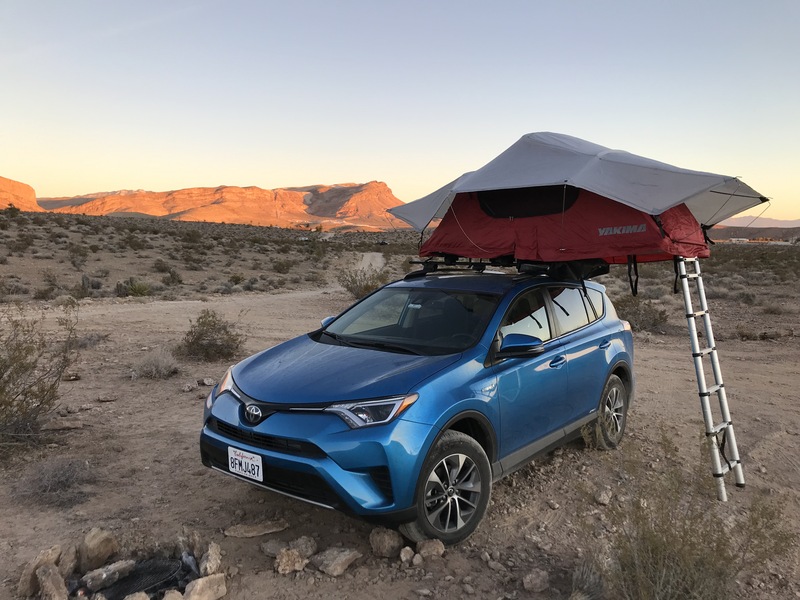 The suggested alternatives were BLM land over an hour away or hotels in Vegas, but luckily we found on freecampsites.org a new free desert BLM campsite just 30min away from Red Rocks to sleep. The next morning we woke to cold darkness at 5:30am to climb a dream of Sadie’s “Olive Oil”. 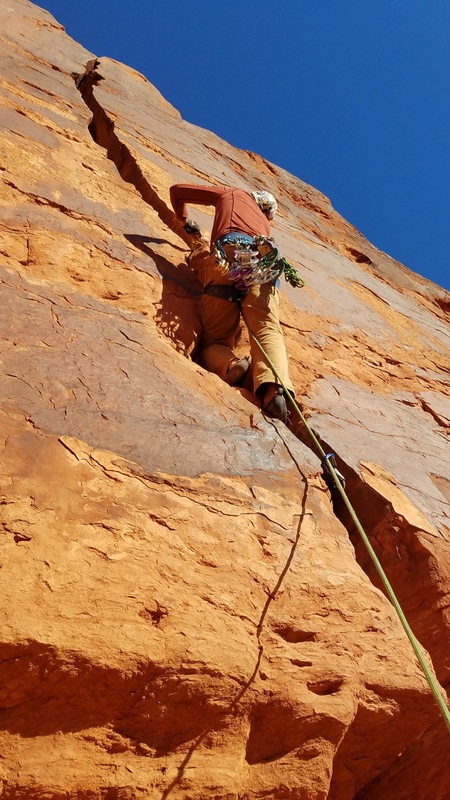 A well starred, 5.7 five pitch climb in Pine Creek Canyon. 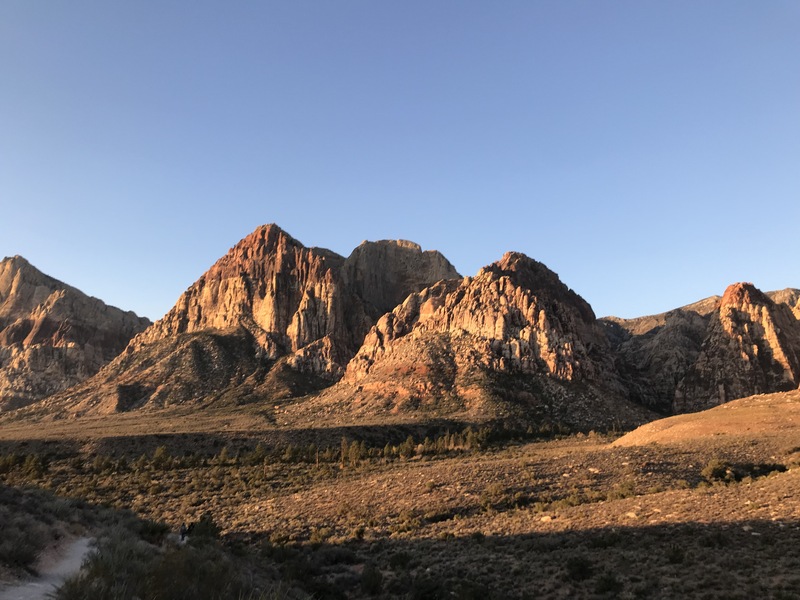 The guidebook said it was so popular we should be first ones at the Red Rock Canyon gate (6am) and be prepared to immediately start hiking with packs on after parking if we wanted to climb it. I guess they were not kidding. At 6:08am we were facing 14 red pairs of taillights waiting to enter the park. We followed a train of cars chugging into the Pine Creek Canyon Trailhead parking lot. We left the parking lot at 6:45am at the end of pack and arrived to the base at 7:50am as the 4th party in line. Everyone had gotten here around the same time and the first party of Arizonans had not started up yet. 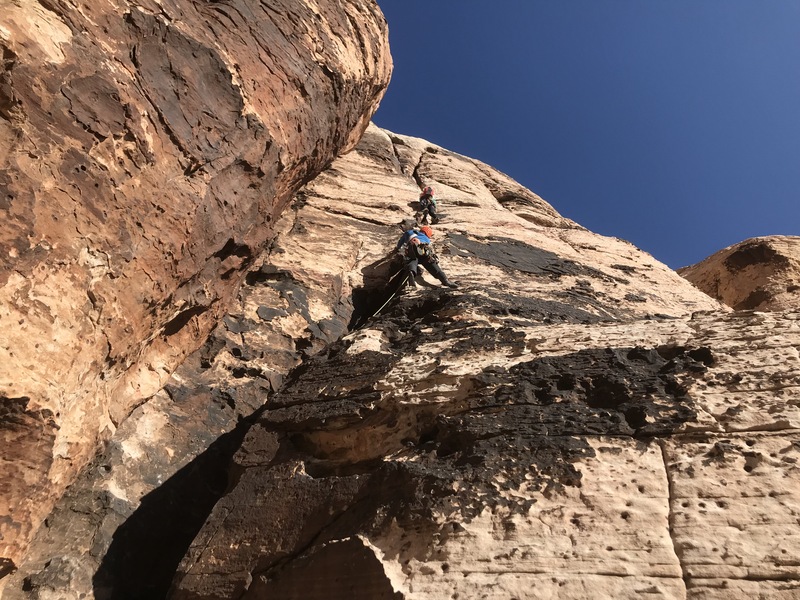 Everyone was moving fast (we thought) as we started climbing at 9:20am up the wall, but for some reason the route jammed up again at the first belay with five of us standing around or in a small alcove. Shortly after arriving to belay (at 10am) five other parties showed up below us. Including a group of eight! My god, at 10am I wasn’t sure that party #9 would be able to climb the route before 4:30pm sunset. Hand Jam? Finger Jam? No, people jam is the crux. The jam ahead cleared out at 11am and we were able to climb with only marginal waits for the rest of the day up a decently good climb including some hand cracks and ending in a stemming chimney finish to the Rose Peak summit register. It was good, but not as amazing as the stars suggested. 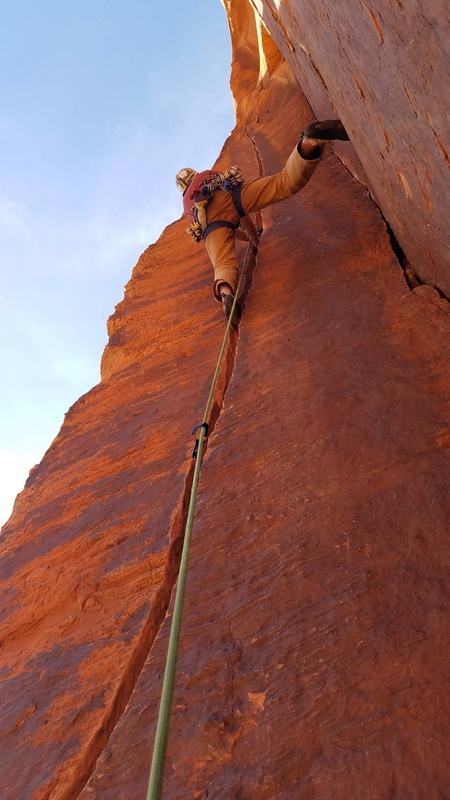 In classic multi-pitch moderate form. We had ended up waiting (4hrs) as long as we actually climbed (4 hrs) on the route. The next morning we were a bit nervous about climbing Black Orpheus (a Fred Becky 100 climb classic) with a 2 hours approach, 4 hour decent and still 8-11 pitches of climbing in between. All needing to be covered in the ten hours of sunlight available. 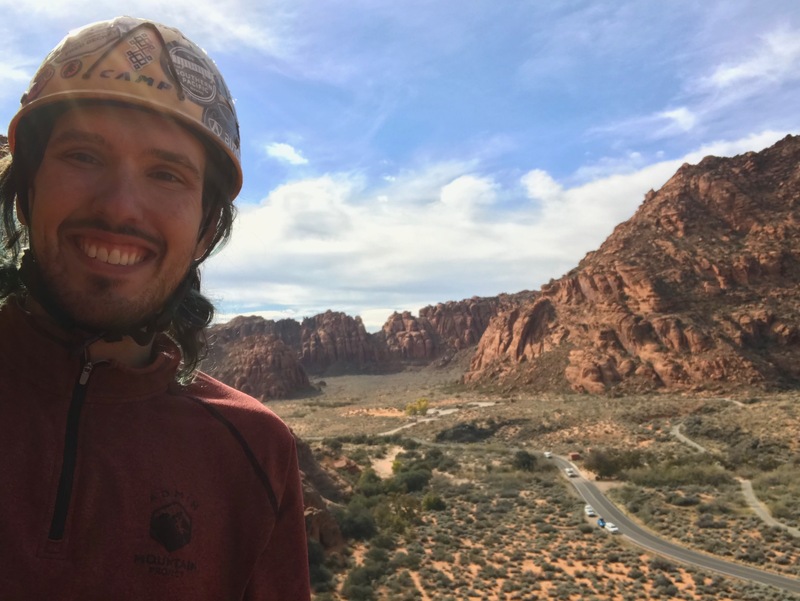 So we headed up to Saint George to check out this mysterious area that I’ve near heard anyone talk about despite it hosting 1000+ routes! Two hours later we arrived like a couple of dirt bag climbers to a normal Mormon, 2.5 child, suburban neighborhood and started walking up to Bluff Street Cracks behind the development. 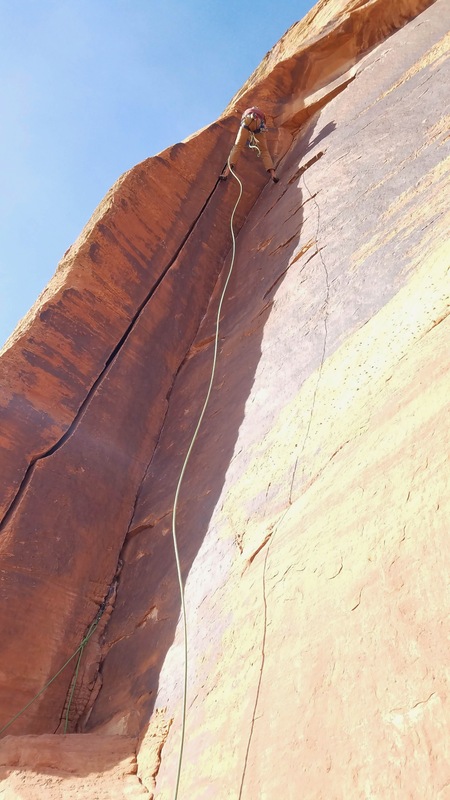 We found just amazing, splitter, laser cut Indian Creek style desert cracks all in the 5.10- range. We ticked off one after another fantastic aesthetic lines as I worked up enough courage to try the gapping 5.10 offwidth Inspired and Perspired. Leading up that thing I had to give a climber scream to both push through the pain of a leg rotation + cam and also to provide courage pushing up through a levitation transition without solid feet. It was full-value and hard, but eventually I conquered it! 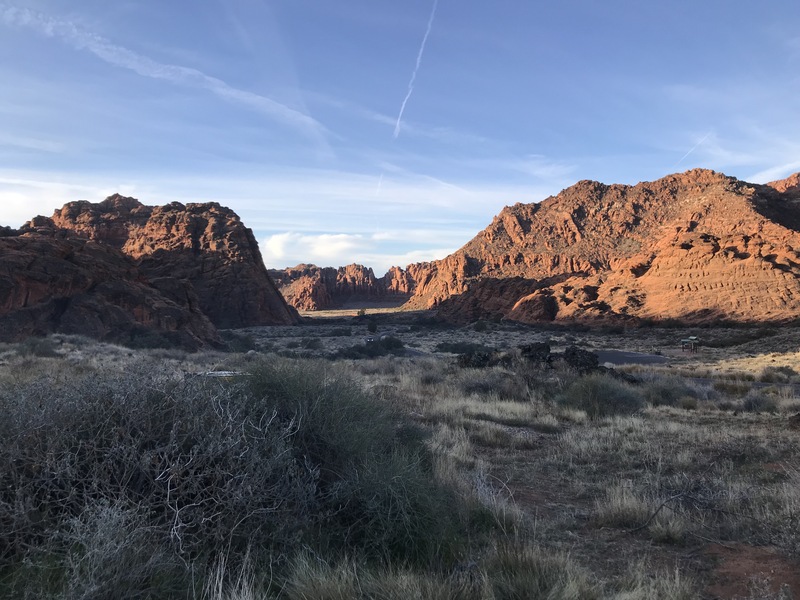 Sadie wanted running water and showers for the night so we decided to pay for parking in nearby Snow Canyon State Park. 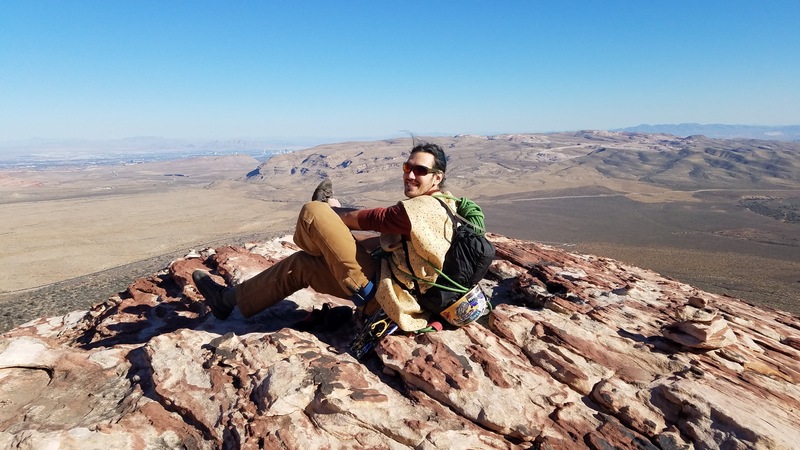 Turning off the state road near a blob of marshmallow mountain rocks similar to Zion high country our mouths widened into smiles as we descended into a canyon revealing headwalls, slabs and fingers of rocks forming ridges. A scene a mixture of a featured mini-Red Rocks, a Zion spectrum of tan sandstone colors and the deep red canyons of the Fiery Furnace. We couldn’t believe we had stumbled upon such an amazing place we had never heard of before. Woah is this red rocks? 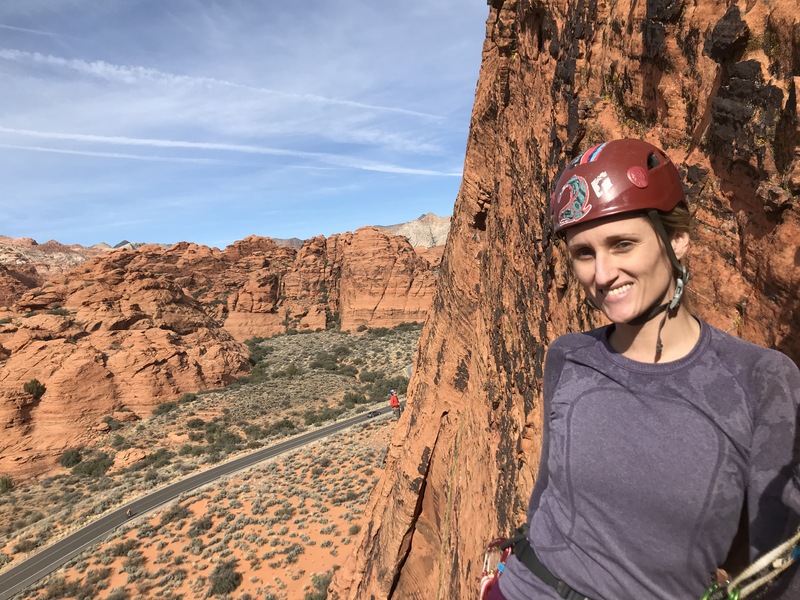 Sadie rightfully exclaimed it was meant for us to discover and climb here the next day instead of trying out the other Saint George crags a little north at Prophesy wall. 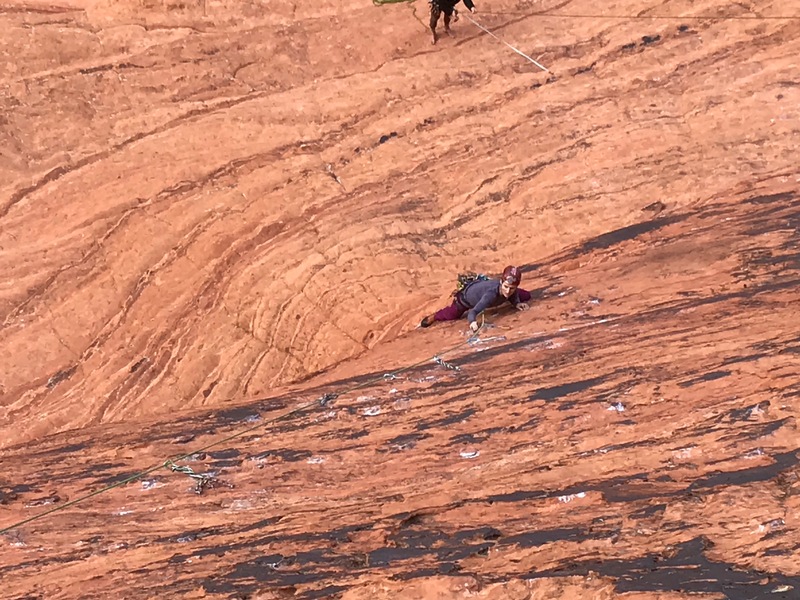 We first approached the Atomic Indian just off a sandy trail up “the best crack in Snow Canyon”. A #3 sized, large hand crack in a blown out alcove that becomes smaller and more overhung to ring locks and then perfect fingers just at the anchor. 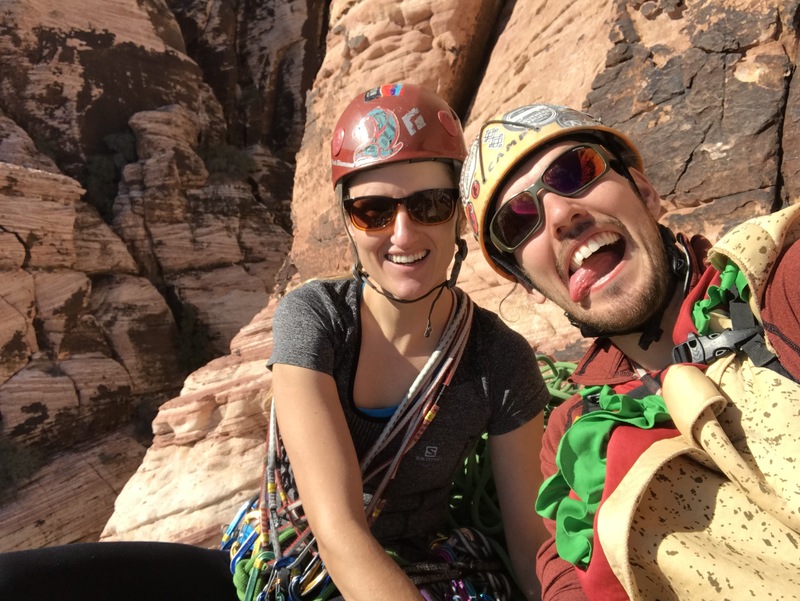 Going at 11a, its much outside my typical ability, but given the ready protection and Sadie’s encouragement I went for it and lead my first 5.11 trad route with a single hang thanks to a back step stem! We then shifted over into the shade for a long 30m, sport climb up on Island in the Sky. A generously bolted route protecting a delicate face with varnished holds and friction feet grinding off sand particles on tentative smears. The right leaning ‘Roaring of the Greesepaint’ was a great lead that required balance and finesse. 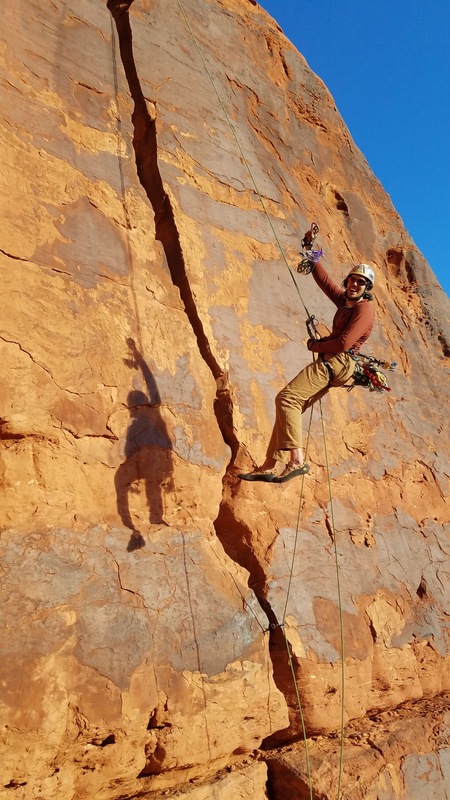 After chatting with some Zion canyoneering guides, we took off at 1pm to hit Benson Creek Canyon quickly before sunset, an hours drive North. 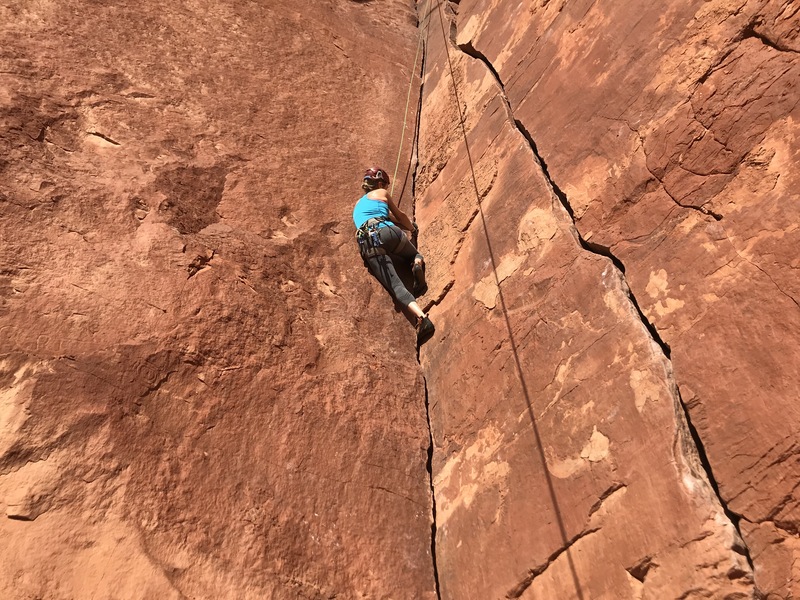 Trying to cram in one last easy canyoneering adventure. However, after a couple missteps route finding, dropping temperature and dwindling time. 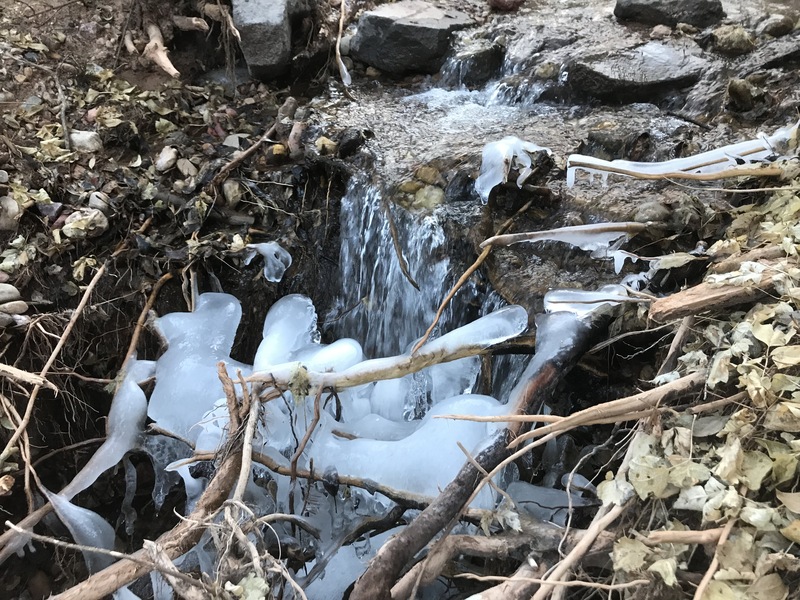 We decided to turn back instead of route finding our way out in the dark and transforming into these river icicles. This concluded our varied, surprising and extremely fun adventure journey out to Utah before cooking, eating and conversing for a few days with Sadie’s family. Putting away the gear and donning on our front-country clothes over showered bodies. I cannot wait for our next off the main track adventure. 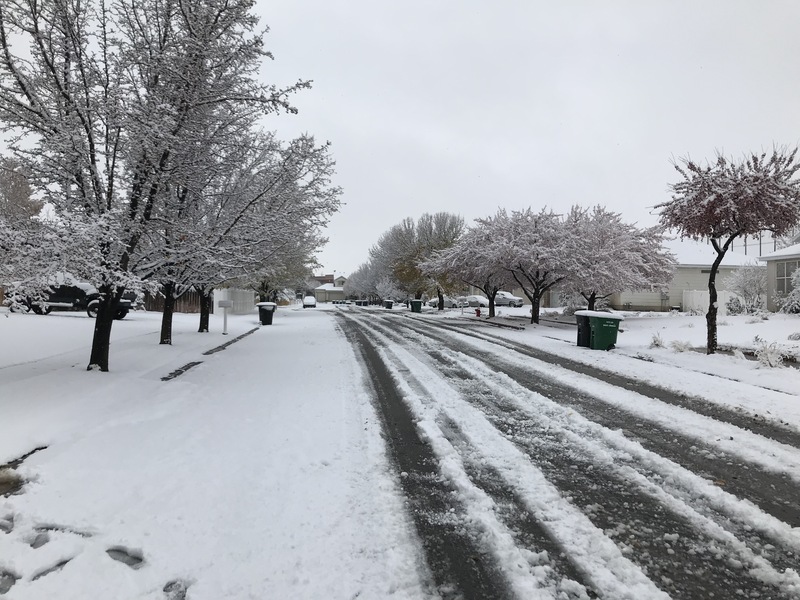 It snowed two feet while in Utah.